For vegans, it’s very easy to get sick of falafel, hummus, and chips. They seem to be the default options on many an uninspired menu, and every takeaway cafe in the UK seems to have a standard dry, chewy falafel wrap or sandwich on the menu. But still – is it possible to get sick of proper falafel? I mean fresh falafel cooked by someone who knows what they’re doing. 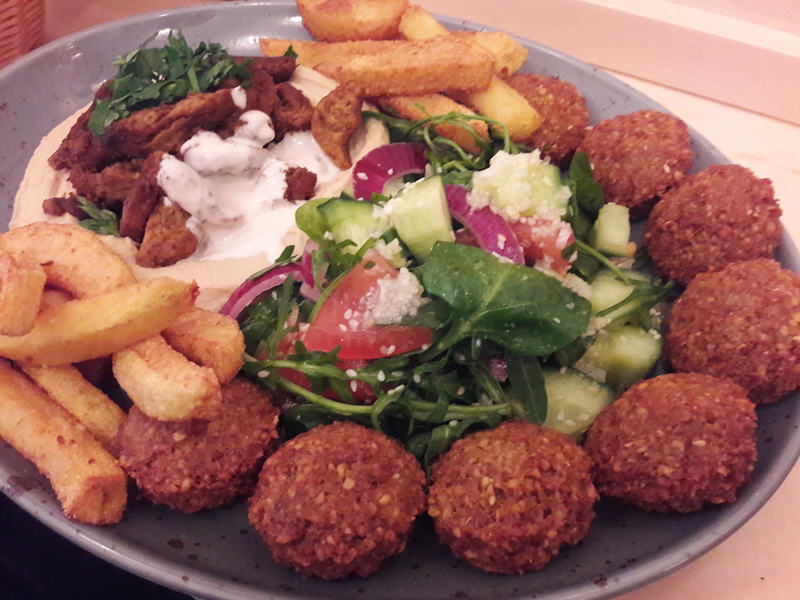 I have had some top notch falafel in my time – most notably from Go Falafel in Manchester, and with honourable mentions to Dr Falafel in Vienna, Hummus Bar in Hungary, and L’as du Falafel in Paris. The Czech Republic is notoriously resistant to immigration, and as such there isn’t really a thriving falafel scene here (I genuinely believe that falafel is one of the greatest pro-immigration arguments – it’s right up there with human decency as one of the reasons we should welcome people in). So I was delighted when Paprika opened up in 2017. It’s a teeny place with some indoor seating, but it’s probably better suited to takeaway, as it’s always jumping. They serve meat, but also have some great vegan options, including shawarma along with the standard falafel and hummus dishes. Dr HH and I love to share the vegan plate. It consists of hummus, shawarma, tahini, fries, bread, falafel, and salad. The shawarma has a great texture, and is really well seasoned – the best vegan shawarma in Prague by a mile. 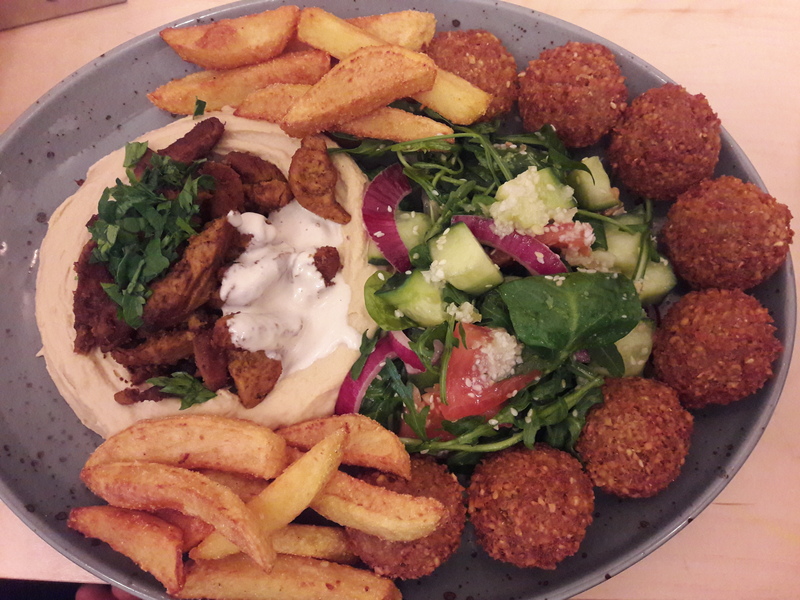 And the falafel, chips, and hummus are all absolute perfection (in fact, the chips are also the best in Prague). 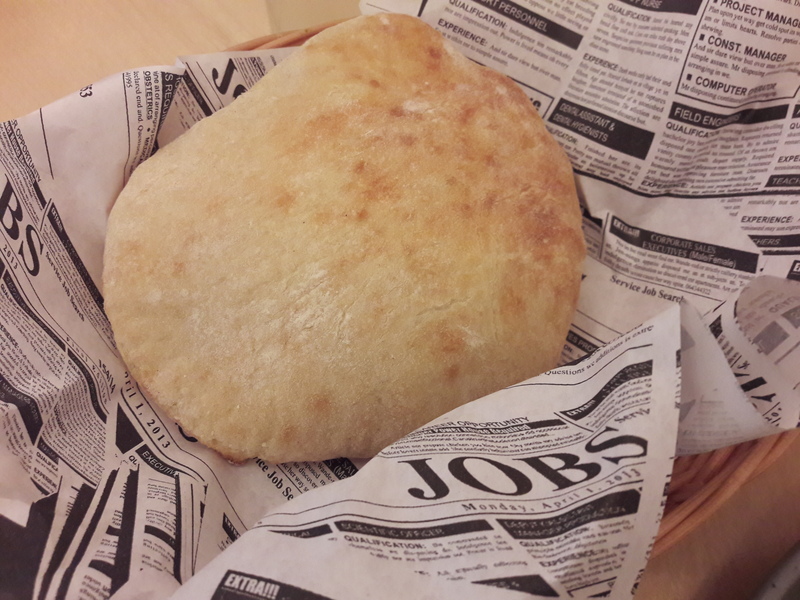 Oh, and did I mention the bread? It’s so soft and pillowy – sheer perfection! On less indulgent days, I’ve also been known to simply grab a falafel pita. Again, it’s hard to go wrong with this. 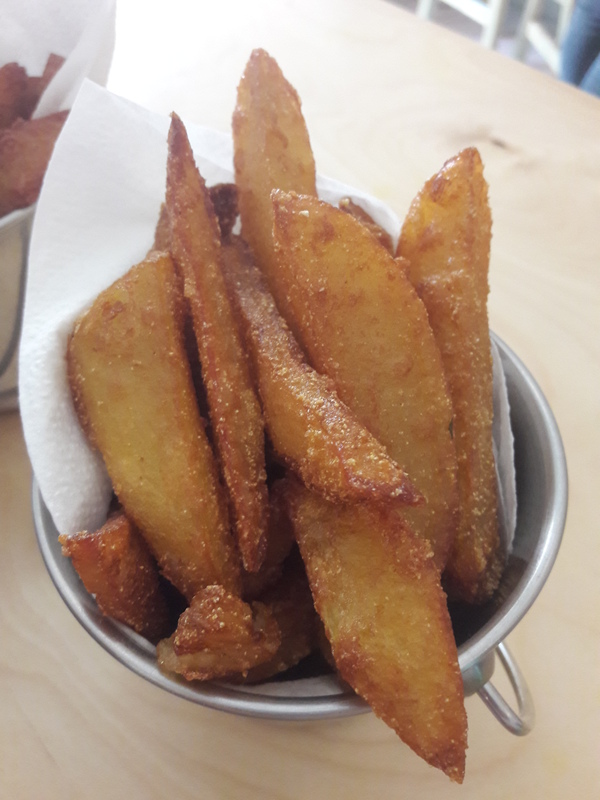 One of my most used phrases in this VeganMoFo is probably going to be: “I know chips don’t really belong to X cuisine, but still…” I mean, look at those chips. Beautiful! VeganMoFo friends, do you ever suffer from falafel fatigue? And where’s your number one falafel spot? 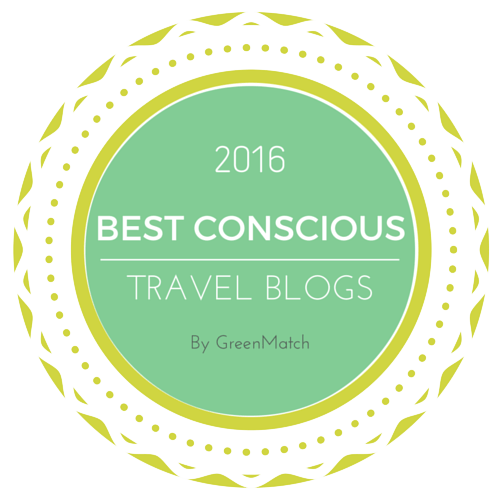 This entry was posted in Travel, Vegan Mofo and tagged Paprika Prague vegan, vegan Prague, vegan travel, veganmofo18. Bookmark the permalink. It’s essential to have a good falafel spot near your place of work! I get falafel fatigue and frustrated I can’t get enough of them all at the same time! haha. I like when a place centers around falafels and there aren’t too many places that do that. There is place near us that opened called Naf Naf Grill, I really want to check out their falafel game at some point. Falafel places are all the rage in Manchester, it’s been tough living without them in Prague. It’s no wonder this one is always so busy! I love good falafel. 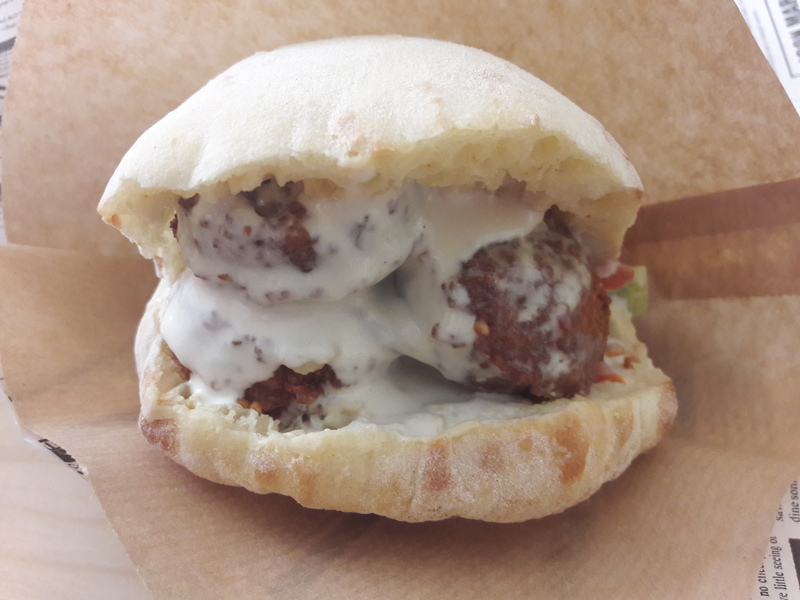 I’ve had some not so great falafel before, but there’s a place in my hometown that has the best falafel I’ve ever eaten and I could never tire of it. Every vegan has their number one falafel spot! Yum! The vegan plate looks amazing; what a nice variety! Yes, there are plenty of exciting elements! I LOVE middle eastern food! We have a place about 5 mins away that does a great feed but it’s so oily so we have only been twice then never went again! I sure do enjoy creating at home the kind of ‘dip’ plates they have though! Too much oiliness can definitely be an issue – at least you can recreate some of the dishes at home!